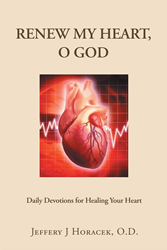 “Renew My Heart, O God: Daily Devotions for Healing Your Heart” from Christian Faith Publishing author Jeffery J. Horacek offers 366 days of Bible study, prayer, and meditation organized around monthly themes, such as God’s love, serving God, renewing the mind, and forgiveness. It was written to bring the message of the light and love of Jesus Christ as a beacon of hope and encouragement while coping with the troubles and pain of this earthly life. “Renew My Heart, O God: Daily Devotions for Healing Your Heart”: 366 days of devotions and meditation specifically chosen to offer comfort, peace, and hope. “Renew My Heart, O God: Daily Devotions for Healing Your Heart” is the creation of published author Jeffery J. Horacek, a practicing optometrist, avid student of the Bible, and former Bible study teacher. “It is my prayer that you will find God within these pages and that you will cultivate a new desire to pray consistently and to read God’s Word. It is reading His Word and being in His presence that will transform your life and renew the wounded heart within you. It’s time to exchange your sorrow and pain for His comfort and peace, your guilt and shame for His assurance and forgiveness, and your turmoil and despair for His hope and joy. Ezekiel 36:26a says, ‘I will give you a new heart and put a new spirit in you;’—it’s time to come and enter in—God’s waiting for you inside.” -Jeffery J. Horacek, O.D. Published by Christian Faith Publishing, Jeffery J. Horacek’s new book is an inspiring daily guide to healing and the renewal of the heart and soul. View a synopsis of “Renew My Heart, O God: Daily Devotions for Healing Your Heart” on YouTube. Readers can purchase “Renew My Heart, O God: Daily Devotions for Healing Your Heart” at traditional brick and mortar bookstores, or online at Amazon.com, Apple iTunes store, Kobo, or Barnes and Noble. For additional information or inquiries about “Renew My Heart, O God: Daily Devotions for Healing Your Heart,” contact the Christian Faith Publishing media department at 866-554-0919.